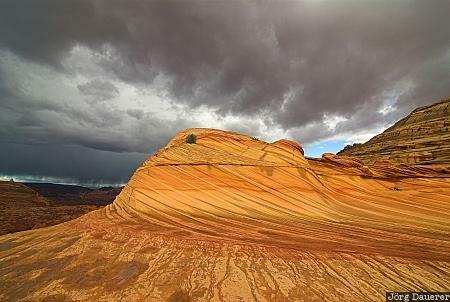 Low thunderstorm clouds over the sandstone formation "Second Wave" in the Coyote Buttes area. The Coyote Buttes are in northern Arizona in the south-west of the United States. This image was taken in the afternoon of a cloudy day in October of 2006. This photo was taken with a digital camera.